While Phuket is best known for its beaches and nightlife, the island of Koh Tao has a little bit pf everything. Meaning Turtle Island, this is a great place to come to see several species of breeding turtles, but it’s also famous for its coral reefs and amazing scuba diving opportunities. Of course, there are beautiful beaches here too, and popular nightspots, particularly around Mae Haad Beach, or you can go hiking through the jungle to see land-based wildlife and birds and enjoy breathtaking vistas from elevated viewpoints. If you’re looking at the best ways to travel from Phuket to Koh Tao, we’ve got information on all the different ferries. Koh Tao is a small island, measuring just 21 square kilometers (8 square miles) so it’s not surprising that it doesn’t have its own airport. This means the only way to get here is by sea, but luckily, being such a popular destination, there are several different ferry operators to choose from, giving you a number of different options. From Phuket it’s a long journey – as the crow flies it’s only 290 kilometers (181 miles), but your journey will include a bus and a ferry, both of which take a long time. There is another option but it’s not necessarily going to be much faster, and it’s going to cost you a lot more money; you could catch a flight from Phuket to Koh Samui and then a ferry to Koh Tao. We’ll give you the information on all the different options so that you can decide which is the best way to get from Phuket to Koh Tao. Although the majority of tourists will take a bus and ferry from Phuket to Koh Tao, we wanted to briefly touch on this other option. As mentioned above, you would fly from Phuket to Koh Samui and then catch a ferry to Koh Tao. The problem with this route is that there’s only one ferry a day from Koh Samui, departing at 11:30 in the morning so you may have trouble catching a flight that gets you there in time. The ferry itself takes over 3 hours, while the flight is about an hour. Traveling this way from Phuket to Koh Tao could be a good idea if you wanted to spend a little time on Koh Samui anyway, as you can break up your journey, but otherwise, we wouldn’t recommend it. You cannot get from Phuket to Koh Tao by ferry alone as there’s a large section of land that you will need to get across first! So, your journey will involve a bus or taxi ride, and then a ferry crossing. You can travel independently if this is what you prefer, taking a bus from Phuket and heading to Surat Thani, and then getting another bus from there to the ferry pier, or catching a ferry from Surat Thani. This could potentially save you some money but it’s unlikely to be any faster and could result in connection problems if you get delayed. A better option is to buy a combined ticket that covers you for the entire journey. Prices are still very reasonable, and you then have the assurance that if there are delays along the way, the ferry may wait for a little while, or your ticket can be used on the next ferry. All ferries from Phuket to Koh Tao arrive at the main pier on the island, at Mae Haad, but when leaving the mainland there are two different departure points, depending on which ferry company you travel with. Lomprayah is always a good option as it’s a reputable company and they operate modern and comfortable catamarans and buses. The ferries (catamarans) are well equipped with snack services and washrooms, and there’s a good selection of seats to choose from depending on whether you would like to be out on deck, or inside and under cover. Lomprayah ferries run from Tapee Pier in Surat Thani, and you can pick up their buses from a selection of different points on Phuket – the main departure point is the Lomprayah office in Phuket Town. From here the total journey time is around 9 hours and 15 minutes. The bus departs at 10am and arrives at Koh Tao around 7:15pm. If you’re staying in Patong you can also get a hotel pick-up with Lomprayah but be aware that this will take several hours longer than traveling direct from Phuket Town; even so it’s a convenient option to buy a combined ticket and not have to worry about finding your way. 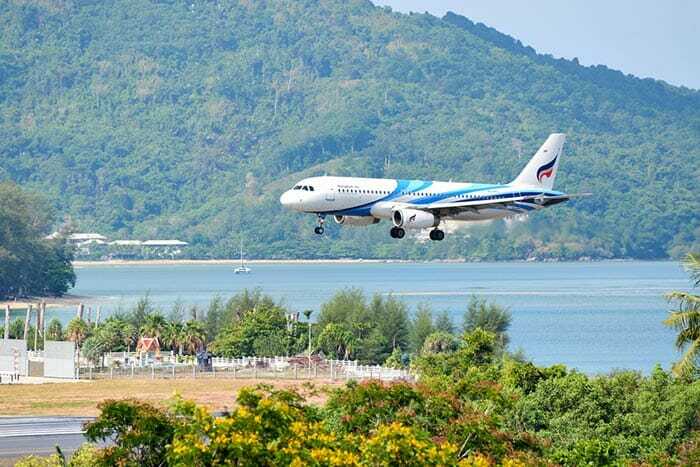 The final option with Lomprayah is to depart from Phuket Airport. This takes roughly the same as the bus and ferry from Phuket Town, but it is quite a lot more expensive. If you’d like a viable alternative to Lomprayah, you could look at Seatran Discovery. Another well known and reputable travel company, Seatran offers combined bus and ferry tickets that are essentially identical in price to Lomprayah. The only real drawback to traveling with Seatran is that they don’t have as many departure point options: their buses depart from Phuket Bus Terminal 2, so you would need to find your own way to the bus terminal. Once there though, the buses are quite comfortable and the high-speed ferry to Koh Tao is modern and reasonably comfortable too. There are inside and outside seating areas, as well as a covered upper deck that’s open to the sides, providing great views. Seatran departs from Phuket at 9am, and the journey time is roughly the same as with Lomprayah, taking about 9.5 hours so you’ll arrive at Koh Tao at 6:30pm. So, there’s really not much to separate these two companies when it comes to catching a ferry from Phuket to Koh Tao. The prices are basically the same, and the journey takes essentially the same amount of time too. Which one you choose will probably come down to where you are staying in Phuket and which travel company provides the closest pick-up.